This machine is my oldest PS/2 model 80. 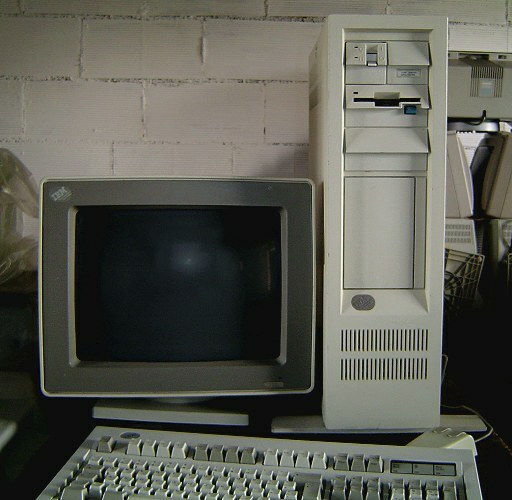 Older PS/2 machines can be easily noted because of the orange power switch (it was later replaced by a white switch) and because of the white model number/serial number label on the side of the power switch (in the contrary of the black labels used in later exs.). In my experience, 16 MHz PS/2 models are rather vulnerable. I bought at least 4 or 5 different PS/2 80 16 MHz, and I found most of them were inoperative, usually because of a dead or faulty main board. I succedeed in building up this ex. which is, as a matter of fact, a "compilation" of pieces from different 8580-071 units: for instance all chips on the planar have date codes from 1987 or early 1988 at most, whileas there is a 20.10.89 print on side panel (planar is not a replacement, as it came to me together with the case, i.e. together with the s/n). The only functioning "orange switch" (see above) power supply also died after a couple of months of service, and I had to replace it with a younger spare part (white switch).